Back to School Lunch Ideas - The Sandwich Remix! - Kosher In The Kitch! Back to School Lunch Ideas - The Sandwich Remix! - Kosher In The Kitch! Home / Uncategorized / Back to School Lunch Ideas – The Sandwich Remix! Back to School Lunch Ideas – The Sandwich Remix! This September it’s time for a sandwich remix. When preparing lunch and snacks how often do we rely on the good ol sandwich? As the mom of a one year old and a former pre school teacher, I know that sometimes you just have to switch things up. When your kid keeps bringing home the same soggy tuna sandwich and smashed banana that you had packed the night before, it’s time for something new! 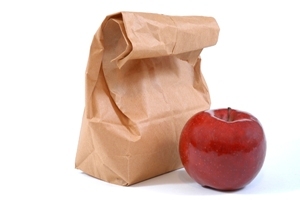 Below are some tasty lunch options and snack ideas that will jazz up your kids lunch box. * Sandwich shapes. Select a bread such as whole wheat, whole grain, spelt, or cinnamon and raisin. Then pick a filling, PB&J, tuna, hummus, egg salad or cream cheese. Once you have prepared the sandwich use cookie cutters to form shapes such as stars, hearts or even these super fun Ninjabread Men Cookie Cutters. * Israeli Pita Pocket. Slice the top off a pita and fill the pocket with falafel balls, hummus and salad. * Wrap it up! There is a large selection of wraps available from high-fiber multigrain flour tortillas to spinach wraps, tomato basil or even plain white if that’s what your child prefers. Spread on mustard, hummus, light salad dressing, or green or sundried tomato pesto. Then add chicken salad, tuna, egg salad, deli meats or cheese and top it off with tomato, sliced onion, and shredded Romaine lettuce. Roll it up and wrap in foil. The kiddies will enjoy eating it like a burrito by unwrapping one end and digging in! * Pasta Salad. Pasta salad tastes great cold so it makes for the perfect school lunch! Prepare the salad with whole wheat or whole grain pasta for added fiber and include either chicken or cheese and lots of veggies for both taste and nutrition! Toss everything together with a light Italian dressing or simply add extra virgin olive oil and some salt and pepper. * Muffins blueberry, chocolate chip, apple cinnamon, and cranberry are all yummy options. If you make them in advance and freeze them all you have to do is pull one out of the freezer in the morning and it will be ready to eat for recess! * Fruit cups. It’s best to prepare your own than use the store bought ones since they are full of sugar and often have preservatives. Dice up fruit in the morning and fill up a mini container with your own selection of fresh fruit. This can be prepared the night before to save time in the morning rush! * Veggie sticks. Carrots, celery, cucumbers and pickles taste great sliced up with some dressing in a small container. * Send along an ice pack! You want to keep the food cold until lunchtime so be sure to include an ice pack. If you won’t want to worry about your child forgetting the ice pack in school then freeze a water bottle or juice box and use that instead. This way, not only will it keep the food cold but your child will have a fun slushy drink to enjoy as well. * If you are packing dressing for salad, or a sandwich with a condiment then pack it separately in a small container and include ketchup, mayo and mustard packets so they can top their sandwich during lunchtime so it doesn’t get soggy. * Ziploc Snack Bags are the perfect size to pack for lunch and snacks. They fit just the right amount of pretzels, chips and crackers. * Use Gladware or Rubbermaid containers. They have a large selection of different sizes so whether you are packing a wrap, salad or dressing you will find the perfect fit. Also, since they are not pricey you don’t have to worry if your kid leaves it behind in school one day!